The rescue of Cinderella from poverty and abuse relies on footwear. As the tale of the use of the everyday as a vehicle for social advancement, a transformation in circumstances, can be seen as a metaphor, it is to slippers that we turn for Object No 19. The story of the slippers appeared in an obituary of the first Vice Chancellor, Walter Perry and in the New Scientist article marking the 10th anniversary of the OU. 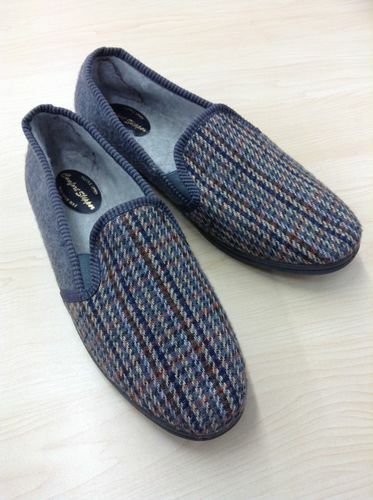 Some staff treasured their slippers and a pair of the original carpet slippers issued to staff were donated to the Archive by Peter Price, Clerk to the Council, on his retirement in 1997. It might attach too much weight to these items to see the slippers acting as a signal indicating the approach of the early OU to learning and teaching, that just as the sole needs to be embraced by a protective surround, so also does the soul. However, they are a reminder that the OU was opened in a hurry. It was just six years since Wilson had proposed the idea of a university of the air. A university of the air needed an earthbound embodiment but there had been little time to construct physical buildings amidst all the planning of pedagogy, the creation of organisational structures and the recruitment of staff. The slippers helped to preserve the flooring, but also indicated that this was an institution which valued the comfort of its staff. It also recognised thst it could learn from everyday experiences. Just as the OU was being beamed into living rooms via the BBC, so familiar objects from the living room were available at its headquarters. Prospective learners were offered a message that education was not provided just by aloof theoreticians in ivory towers, it was constructed by people in comfy slippers. This entry was posted on Monday, August 27th, 2018 at 10:08 am by Daniel Weinbren	and is filed under 50 objects, History of the OU. You can follow any responses to this entry through the RSS 2.0 feed. You can leave a response, or trackback from your own site.